Shop Update: Lot's To Talk About! Wanted to fill in the blanks this week with a little bit more of a news update than we usually do. Maybe it’s everyone sensing that Spring is just around the corner or the fact that tons of new equipment has showed up in the past few weeks, but there’s lot’s happening in the shop these days. Call it a reward for having been a dedicated Pinarello dealer since the first day we opened the shop or maybe it was the super special customer that’s going to give it a home. 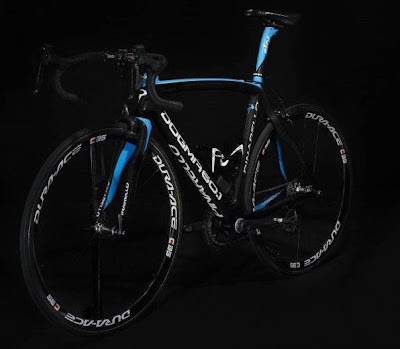 Either way, we were the first shop in the United States to receive a Pinarello Dogma 60.1 Team Sky frameset. This is no replica, it’s a frame that’s pulled from the same batch that the team received frames from and is the only one to be seen in the USA for months. It’s a 55cm that we’re building up exactly like the bike that Juan Antonio Flecha won Het Volk on last week. Here’s a gallery of Ben Swift’s Dogma on Bike Radar. Is it just us, or is it strange that Pinarello barely mentions Team Sky on their website and has no pictures of the squad or the team colorway? Biggest new team to come along in a lot of years and a huge investment for the brand, you’d think they’d take advantage of it at least a little. At any rate, swing into the shop in the next week or so and you’re likely to see us in the process of building it up with a full Di2 kit. Following close on the heels of the Team Sky chassis, we took delivery of a fresh out of the mold BMC Team Machine SLR. Somewhere south of 900-grams, much more sophisticated design than past BMC chassis, the weapon of choice for World Champion Cadel Evans. More on this as we build it up. With brands like Edge, Easton, Lightweight and Zipp all putting out great offerings, staying relevant in the wheel game is tougher than ever. Yet, Campagnolo continues to hold our attention with their amazing blend of technology and raw emotion. We received a few wheelsets from the Italian giant last week including the new Bora Ultra II and Bora I. 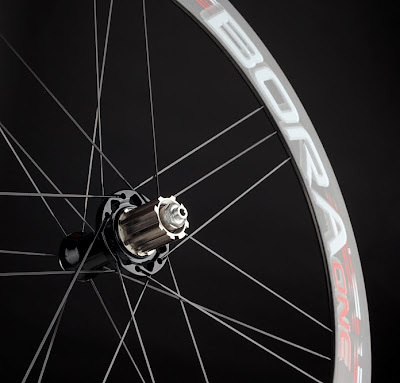 The $3700 Bora Ultra Twos have 50mm deep carbon composite rims, CULT ceramic bearings and an aluminum freehub. As you can see in other posts and on our Twitter feed, we’ve been getting some miles in on the new wheels and are deeply enamored. Look for more of a review once we’ve gotten more miles on ‘em. The plan is to add the Bora Ultra Two and Bora I to our demo wheel program that includes Lightweight Ventoux, Lightweight Standard, most Edge wheels and ultra-plush riding, hand-built, tubeless set-ups. Check with the guys in the shop to find out about riding a pair. Over the winter we’ve spent a lot of time and effort improving our service department. First we moved it into the main shop, then we added touches that’d make any mechanic happy including plush flooring, a perfectly positioned Park repair stand, tons of spares, a big flat screen and a networked computer. We finished the whole thing off with near perfect concrete countertops and a shiny new iMac. The entire service area and Kris are ready to take on anything from a spring tune-up to building a super custom one-off Parlee to gluing on your new tubulars and applying new bar tape. Drop in to check out the new set up and call Kris if you need to schedule any kind of service. 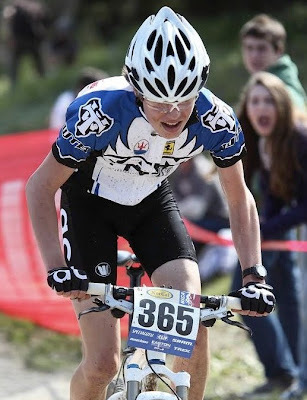 The Juniors on our team had their first outing in the NorCal High School Mountain Bike league. There were over 500 kids that turned out to race! The NorCal league is blowing up and, with the expansion of the league nationwide, expect to see it become even larger. Reigning national cross country champion, Spence Peterson, a Freshman at Tamalpais high, won the Division II JV race by a comfortable margin. Take a second to notice that Spence is a Freshman racing ‘up’ in the JV category and winning. Wait until he’s a few years older. Bob Siegel nailed down the Sophomore Division 2 win while Alex Howard, Skyler Taylor and Jack Keane pulled down third, fourth and fifth in the Boys Freshman Division 2. Bunch of strong guys that should be ruling the roost in years to come. 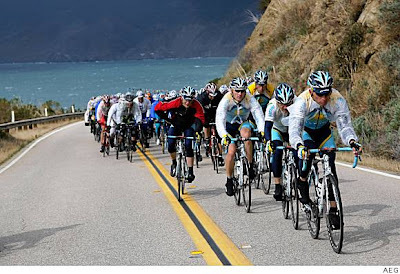 Speaking of the Tour of California, what are you doing to watch the race this May? We’re trying to put a day or two of riding together with viewing of the race a epic locations. Let us know if there’s a program that would appeal to you. We’d love to load up the Sprinter and see the show.